When chemical engineering was launched at the University of Rochester in 1915, the campus was still at Prince Street, and the field was in its infancy. However, talented educators and researchers such as Howard Gardner, George Su, and Shelby Miller helped the department grow and gain credibility. 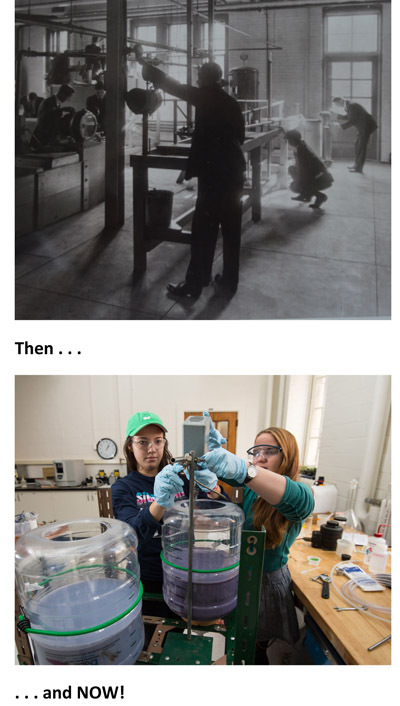 In 2015 we celebrated the 100th anniversary of chemical engineering at the University. See our snapshot and photo gallery pages for a historic look at our department over the last 100 years. In honor of the 100th anniversary of chemical engineering, the department created a Centennial Fund to support its student initiatives, including but not limited to student research grants, student travel awards (to and from conferences and presentations) and study abroad grants. Once $25,000 is reached, the fund will convert to an Endowed Fund. Distributions from this fund will be made with the approval of the chair of chemical engineering. To learn more contact Eric Brandt, the Hajim School’s executive director of advancement (585) 273-5901, or department chair Matthew Yates (585) 273-2335. For more information about making a donation see the giving page.